We've created two tags to separate questions that are about installing Ubuntu and installing something in Ubuntu: system-installation and software-installation. This is with the purpose of getting rid of the install tag. There are over 12k instances (and growing! it's the 2nd most popular tag) that need to be disambiguated manually, so I've doing this mostly organically and it takes forever. Granted, it could go quicker if we set our collective minds to it, but we don't want to fill the front page with that so we'd keep doing a handful at a time. Unfortunately, the questions keep coming in. I try to catch them early but some always fall through the cracks. Please blacklist installation (and its numerous synonyms) so that we can clean up the remaining occurrences. The tag wiki and excerpt for installation clearly states what tags to use instead. Which also links to this discussion: Should we split the installation tag into seperate tags for the installation of Ubuntu and the installation of software? Y'all might want to add further guidance there. Not the answer you're looking for? Browse other questions tagged feature-request status-completed tag-blacklist-request . 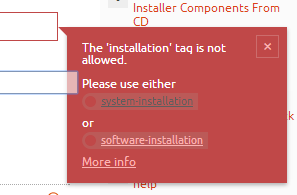 Why is the Installation tag recommended for software installs?